Need a protein-packed breakfast in a hurry? 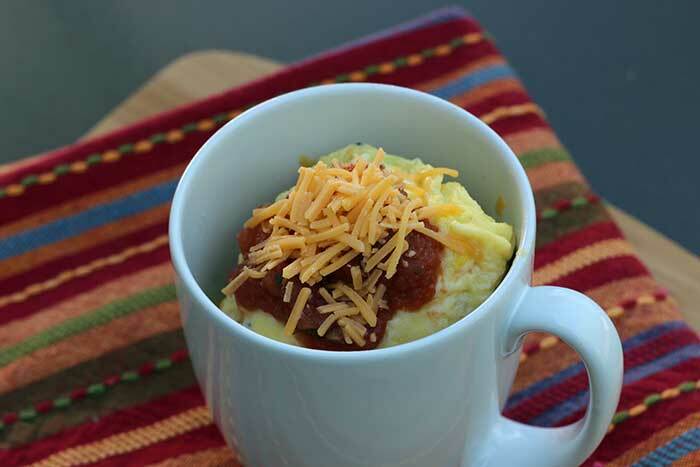 Try this easy microwave egg scramble topped with salsa and cheddar cheese for a Mexican flair. I work out of a home-based office, so I don’t usually need to worry about quick breakfasts. Unless, of course, I’m trying to get to my nephew/niece’s 8 a.m. soccer game on Saturday morning. Yawn. I do frequently need easy meals that can be made in a hotel room equipped with a microwave and mini-refrigerator, however. 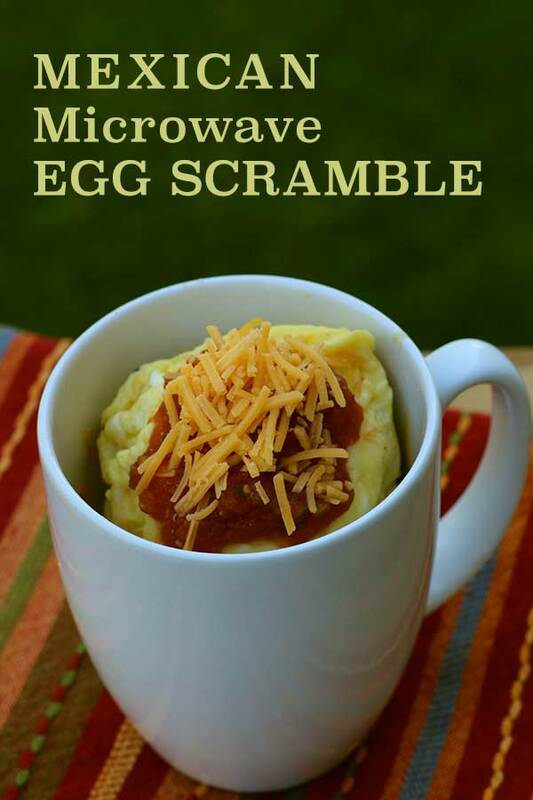 Even though we generally stay somewhere boasting “free breakfast,” I’ve learned that “free” usually means “high-carb.” Instead of straying off my meal plan at breakfast (there will be plenty of time for that at lunch and dinner), I pick up a half-dozen eggs, a small container of milk, salsa, and cheese and make this microwave egg scramble each morning. Heck, if I’m in the room at lunchtime, it makes a great lunch too. Or, if I’m too exhausted at the end of the day to go out for dinner, guess what I eat? You should know that I took some artistic license with the photo. When you cook the eggs as directed below, they will puff up beyond the rim of the mug and then deflate as soon as you remove them from the microwave. A sunken batch of eggs did not make for an appealing photo, so I made two batches and then combined them into one mug for photo purposes. Generously spray a 12-ounce microwave-safe mug with cooking spray. Crack eggs into mug and add milk. Add salt (if desired) and pepper. Beat in a circular motion with a fork until well-blended. Watching sodium? Note that the nutritional information provided does not include any added salt (optional ingredient). To reduce the sodium, use less cheddar and/or a low-sodium (or homemade) salsa. Try Low-Sodium Easy Homemade Salsa. Watching fat? Use nonfat or lowfat milk and cheese.